Astralfish is the latest project from Don Falcone and Bridget Wishart. Don has a lengthy resume, including Spaceship Eyes, Thessalonians, Grindlestone, and Quiet Celebration, but Space Rock fans might know him primarily as commander of Spirits Burning, which for nearly 13 years has been releasing collaboration albums that bring together a global assortment of luminaries from the Space Rock and Prog Rock world. Bridget was a member of Hawkwind from 1989-1991, and two Spirits Burning albums – Earth Born and Bloodlines – were credited to Spirits Burning and Bridget Wishart. In fact, Don is responsible for having coaxed Bridget out of retirement in 2002, and what initially started as contributing to a Spirits Burning album has blossomed into a flurry of activity and contributions to many band’s albums. For a healthy dose of Bridget’s music over the past decade, go to the Aural Innovations Space Rock Radio page and scroll down to show #268, which is an all Bridget Wishart special. 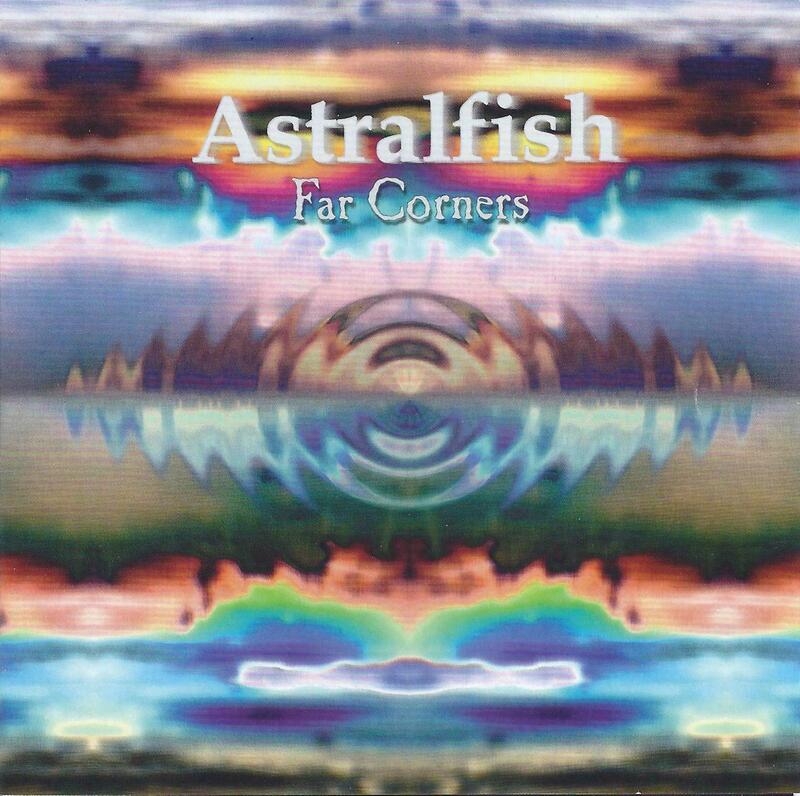 The Astralfish album is structured much like a Spirits Burning album, with Don and Bridget assisted by contributors that vary from track to track. When asked why Far Corners didn’t become the third Spirits Burning-Bridget Wishart collaboration, Don explains that the Spirits Burning albums with Bridget feature vocal songs, showcasing Bridget’s voice. Astralfish intentionally goes in a different direction, being all instrumental and providing a platform to fully feature Bridget’s EWI (Electronic Wind Instrument) playing for the first time. Furthermore, the duo decided to go with smaller ensembles than is typically seen on Spirits Burning albums. Far Corners consists of 16 tracks, mostly in the 2-5 minute range, and the music is more stylistically consistent than most Spirits Burning albums (which are intentionally varied). The album is characterized by a space-ambient-jazz-orchestral-world music flavor, though it can rock out as well. The EWI is quite the chameleon of an instrument, with Bridget emulating a range of instruments including clarinet, violin, oboe, trumpet, guitar, synths, and uilleann pipes. I won’t cover all 16 tracks but will touch on some of the highlights. Far is a space-ambient-jazz piece with beautiful gliss guitar from Daevid Allen, alien synths by Don, ambient jazz (“bowed”) bass from Karl E.H. Seigfried, and Bridget’s EWI doing clarinet. Lil Utburd is a varied track, starting off spacey orchestral, and then launching into a rocking mixture of electro-dance, funk, reggae and jazz, with an EWI produced violin lead melody. Pepper Sky has a soundtrack feel, being dark, intense, orchestral, jazzy, with lots of impressive thematic development for only 4 minutes. Summer Snake features EWI produced saxophone playing jazz leads, accompanied by stinging guitar licks from Frank Hensel. Pacifica is one of my favorites, being a kind of Space Rock-Prog-World Music blend, with EWI produced uilleann pipes and synths and nice acoustic and electric guitars from Doug Erickson. The Otter is a beautiful tune, with a space-ambient-jazzy vibe and a cool rhythmic pulse. Seeds At Night In A Trickster’s Yard is one of the more rockin’ tracks, at least initially, with a driving electro beat and guitar leads from Richard “Karda Estra” Wileman, but suddenly it descends into slow grooving melodic ambience. And then we’re really rockin’ on Cloud Gather, with ripping guitar from Steve Palmer (Mooch, Blue Lily Commission), though it also has its ambient-jazz moments. So yes, after having been immersed in the album it makes sense that Don and Bridget decided to call this project something other than Spirits Burning. Another fine effort from two of the more creative, diverse, and active members of the contemporary Space Rock scene.